Water is an essential commodity and must be properly maintained at all times; especially in a country like ours, where we are largely dependent on non-conventional sources. Even a small leakage may lead to a big problem if not addressed right away. This brings forth a need for reliable plumbing services; which is why we’re here to assist you in keeping your water systems in perfect condition. Our plumbers are well-trained and experienced and know their job so well; you only need to tell them once. Our plumbers are simply the best in the whole Bahrain. Be it the installation of new pipes, or repairing of the existing ones, we focus on providing reliable and professional plumbing services to you. We are available throughout the week and on all days. We provide plumbing services for homes, offices, schools, complexes, or anywhere else. 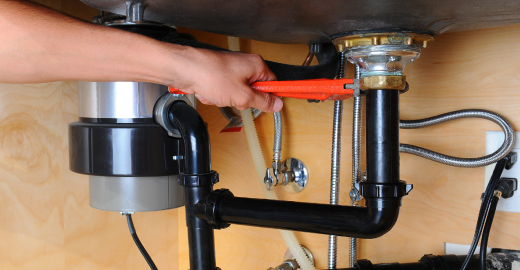 You can count on our plumbers to take care of your plumbing and drainage needs. Just give us a call or drop us an email, we’ll be there to solve all your plumbing needs. Pipe Fittings: All kinds – metal, PVC, plastic etc. Replacements: All pipeline, hoses, taps, shower etc. Water Tank Problems: slag cleaning, leakage etc. It begins with your call or appointment query. Once we get a booking, one of our servicemen teams will visit your place for an inspection. They’ll take a look at the place to identify the problem(s). In case, the problem is minor and can be fixed right away, it can be done with your permission and invoice will be generated. For bigger problems, which might take a lot more time than just a couple of hours, our professionals will take a thorough look at the entire system and estimate the amount of time and cost that would be incurred to complete the work. We charge a modest fee for visiting, which is waived off later in case if you decide to allow us to complete the work as per our estimate. Once the work gets complete upto your satisfaction, we’ll then present to you the final invoice, with all details of materials, labour cost, the cost incurred by us, tax details, etc. Why our plumbers are the best in Bahrain? We, at handyman, believe in constant evolution through progress. Keeping the same value in our eyes, we keep updating our plumbers with the latest ideas, inventions, trends, tools which are being incorporated in the world. We keep training them to maintain their skills updated and polished. We don’t give up on anything. Our people keep striving for better. That’s what keeps us going ahead. With our skills, experience, and enthusiasm, we bring you the best plumbing services in the entire country that is simply unmatched. To deal with plumbing issues, there are some ‘liquid’ solutions available for purchase and they even solve minor problems. However, many clogging problems arise due to eventual deposition of materials that accumulate and harden over time. These liquids may not be effective then. Many times, the right compound is needed based on the type of material that is blocking the flow of water. Trying to change a tap on your own may be risky as, without adequate equipment, the fitting may not be firm and might cause trouble. A plumber’s experienced hands will ensure you never face trouble again. Handyman is available on call through the year. We take bookings and appointments every day. You may book an appointment with one of our plumbers between 8AM-8PM on any day. You may call a plumber to pay you a visit in advance or on an emergency. We try our best to provide reliable services to our customers. Our plumbers are thoroughly professional in their work and always provide honest opinions and estimates. We are a service company renowned for trustworthy, reliable and professional services throughout the country. Our commitment towards our work makes our plumbing services the best in Bahrain. Our plumbers can resolve all kinds of drainage blocks right from bathtubs and toilets, to kitchen sinks. We have multiple solutions to deal with every kind of blockage. We try our level best not to take the entire pipeline apart, and our plumbing team will only do that if there is no other alternative. But even if that has to be done, our plumbers will inform you beforehand and will not proceed without your approval. Our plumber can check your water filter for any foul water inlet, or if the filter needs any repairs or replacement. Our plumber can even check for filters at the main base of the supply as well as other small filters in and around the premises. Sometimes, due to poor maintenance, rusting, etc., the plumbing system in a building may break down causing problem. In such cases of a major problem creating an emergency situation, our plumbers can also visit at night, depending on the availability of team. We’ll reach your place as soon as possible. During the day, our plumbers can come at any time between 8AM-8PM as per your convenience.